Juju/black magic: not just an African thing. Chow Hok Kuen, a 28-year-old British citizen of Taiwanese descent, was arrested in Thailand for having illegal possession of human remains, according to the BBC. The Hong-Kong born Briton was staying at one hotel in Bangkok’s Chinatown while hiding the bodies in another part of the city. Reports say that the bodies were likely from aborted pregnancies, and not full-term babies that were then killed. 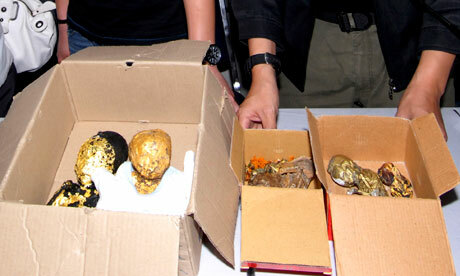 The authorities said the remains were bought from a Taiwanese national for 200,000 baht (£4,000) and could have been sold for six times that amount in Taiwan, where it is thought they were to be smuggled. Black magic rituals are still practised in Thailand, where street-side fortune tellers offer ceremonies to reverse bad luck. The bodies are used in a black magic ritual called kuman thong, where still born or aborted babies are roasted and wrapped in gold leaf by priests Animalist and fringe Buddhist priests, and the mummified corpses are thought to bring good luck. Kuen is currently out on bail but only faces up to one year in prison and a fine of up to 2,000 Thai Baht ($63; £40) if found guilty.